We've been traveling to 30A for years and just love the location. The 'snow white' beaches and blue/green emerald waters can not be beat! Our family fell in love with 30A. For years we stayed all over 30A, but fell in love with Cassine Village - not off the beaten path, but not on it either. Very kid friendly and a great neighborhood for walking and bike riding. Cassine Village is great for strolling in the evenings or sending the kids out for the day. 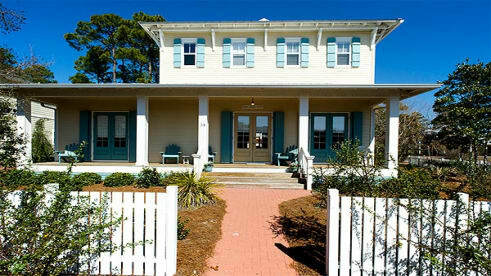 This location is a short walk to several of our favorite dining spots (Cafe 30A and Flip Flops). What makes this house unique? Every bedroom has its own private bathroom (no waiting!) and the house has an outdoor shower. The back porch is screened with two overhead fans. And, if you must work, we have a private office with WiFi and a printer.